On the road again, this time to a work-related university-sponsored course. 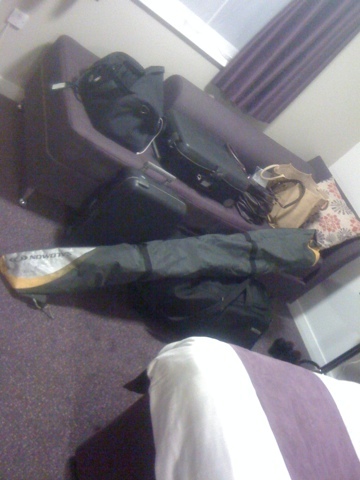 Four nights in a hotel room, with only a fraction of my "stuff". That's not to say I packed light. Oh goodness, no. Hubby is coming to meet me for some skiing at the end of it all, and since I made off for the week with our only car, I have ALL the gear with me. The people in the hotel look at me with a special blend of curiosity and outright fear. Like some sort of Alpine unibomber. So it's probably just as well they can't see me working out to streaming videos here in my room (make that an Alpine unibomber in a leotard). 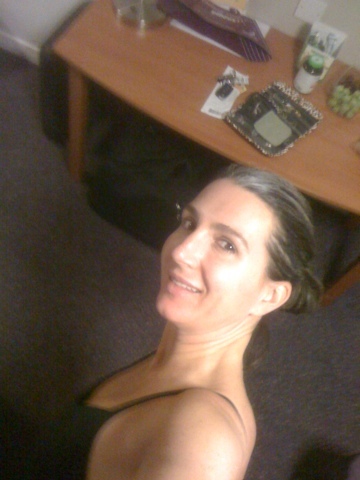 Many years of frequent travel have made me very skilled at using even the smallest hotel room as a workout space. Today's lineup....floor barre and cardio yoga! No space? No problem...no excuses. I'm impressed! I find every excuse in the world. How did you get to this zen place in your determination? A lifetime of having jobs that take me on the road. You just have to think of being away part of your normal routine, and get it done. I'm horrified that you are making direct contact with the carpet - you know people walk on it with their shoes...and who knows where their shoes have been! Sounds like a nice way to end a business trip - hope you are someone fabulous! How do you manage to look so great while working out - I just look like a seal being strangled. Ha! Indeed what doesn't kill us makes is stronger. This time of the year, people are more likely to sicken you with a handshake or by borrowing your mobile phone. Flulike illnesses everywhere. Taking a grocery cart from the stall feels like playing with fire. Makes the carpet, though far from ideal, look tame by comparison. I like to live on the edge, what can I say?